A man had to be cut free from his 4x4 after it was involved in an early morning crash with a taxi at a Preston roundabout. 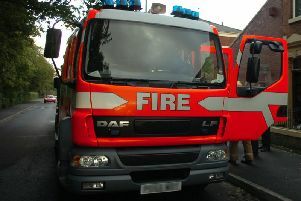 Two fire engines, one from Preston and another from Fulwood, were called to the scene outside The Guild Merchant pub at the roundabout where Tom Benson Way and Tag Lane meet in Ingol, Preston, at 12.30am after receiving reports of a road traffic collision. A spokesman from Preston fire station said that a taxi had made quite a "heavy impact" into the rear of a 4x4 Vauxhall Tiguan. He added that the driver of the Tiguan had suspected spinal injuries, leading to crews removing the roof of the vehicle. The driver was taken out of the Tiguan on a long board to protect his neck and back before being transported to Royal Preston Hospital. Fire crews were on the scene for around one hour.